economic activities depend on . tion from the activities of man. ling of data to generate information in a devised format. nagement, and natural risks assessment . water resources cannot be allowed to deteriorate further. has relative humi di ty range of 70% - 80%. Figure 1. Locations of wells on the map of Uyo urban. the drainage of the town and its physical development. 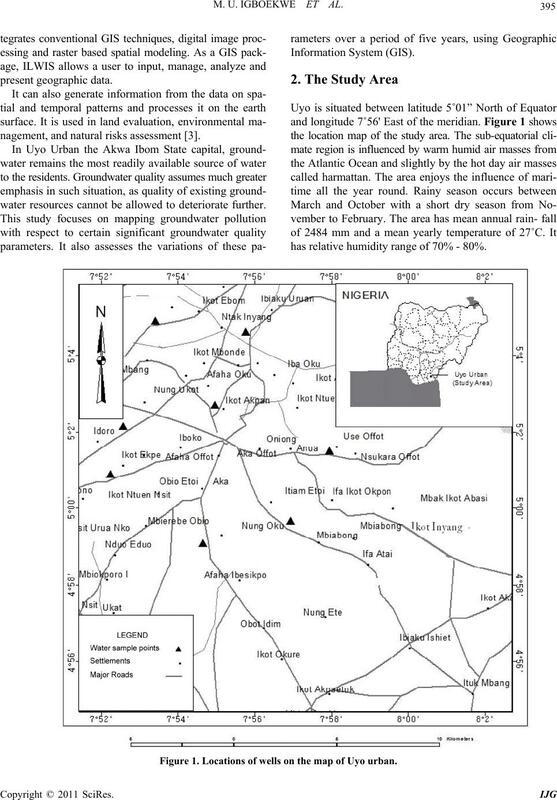 coastal plain sands known as the Benin formation . was the digitization of the various spatial features i.e. ware for further analysis and presentation of resu lts. assess the relationship between some pollution indicators. 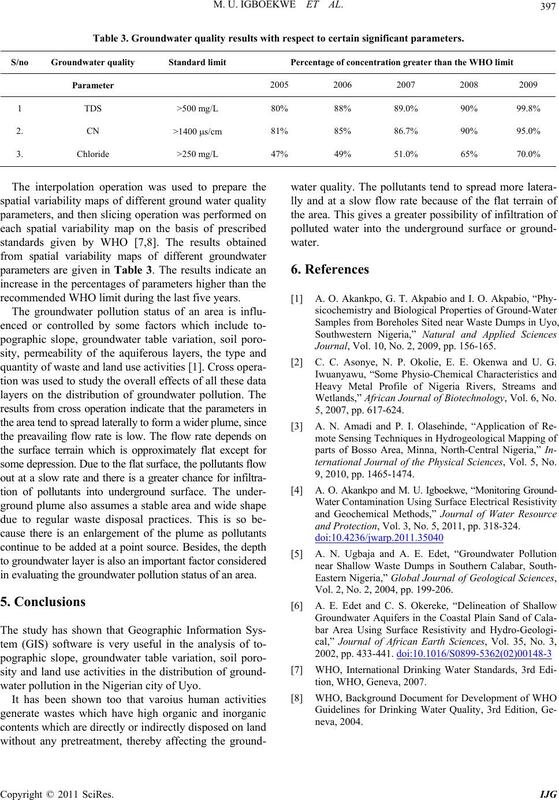 tion as well as depth of shallow wells . Table 2. Correlation coefficient between some parameters. Table 3. 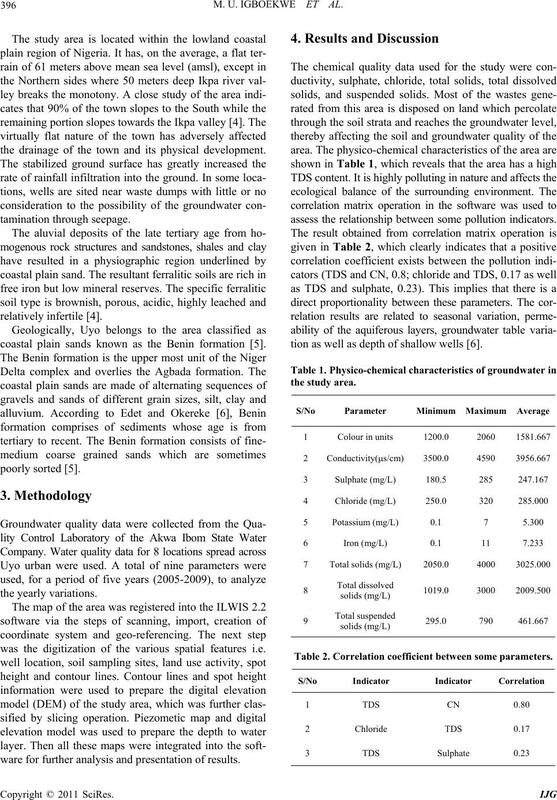 Groundwater quality results with respect to c ertain significant par ameter s.
recommended WHO limit during the last five years. in evaluating the groundwater pol lution st atus of an area. water pollution in the Nigerian city of Uyo. Journal, Vol. 10, No. 2, 2009, pp. 156-165. 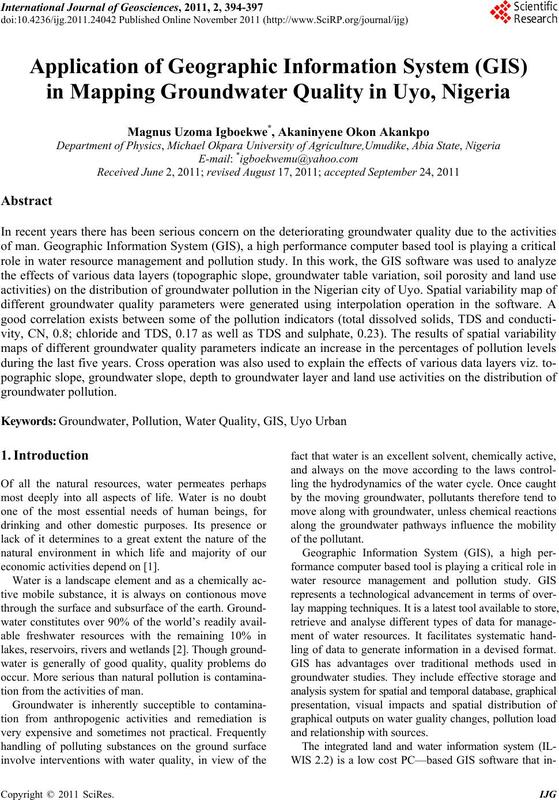 C. C. Asonye, N. P. Okolie, E. E. Okenwa and U. G.
Wetlands,” African Journal of Biotechnology, Vol. 6, No. ternational Journal of the Physical Sciences, Vol. 5, No. and Protection, Vol. 3, No. 5, 2011, pp. 318-324. Vol. 2, No. 2, 2004, pp. 199-206.